Elements Massage™ is a leader in the retail massage industry. Founded and owned by a massage therapist, our business is built on respect for our therapists. We have Massage Therapy jobs to fit your life. With three locations to choose from, or work at two or three. Clients are waiting for you! Flex Time - Minimum 2 shifts per month, pick up shifts on a phone app. 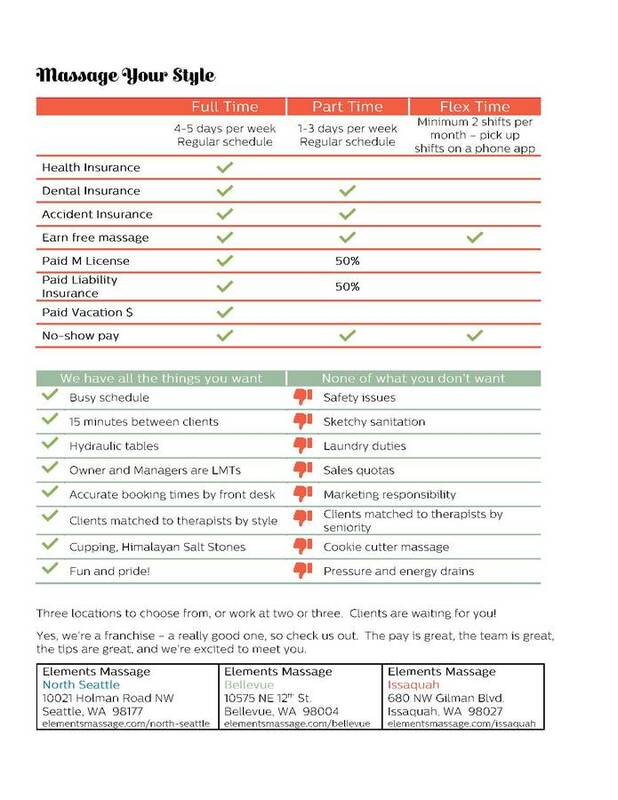 Three locations to choose from, or work at two or three. Clients are waiting for you! Yes, we are a franchise - a really good one, so check us out. Therapists tend to stay a long time. The pay is great, the team is great, the tips are great, and we're excited to meet you. Connect with us on our Elements Massage Careers Facebook Page, or learn about our company benefits and team on our Careers Website!